For students of astro navigation, the various definitions of azimuth and bearing can cause much confusion. It is hoped that the following will help to clarify this topic. Bearing is the direction of something in relation to a fixed point. A bearing can be measured in degrees in any direction and in any plane. For example, in marine navigation, relative bearing is measured in the horizontal plane in relation to the ships heading from 0o to 180o to either port (red) or starboard (green). For example, the relative bearing of an object on the port beam would be Red 90o and an object on the starboard bow would be Green 45o. Note. The definition given above is according to the Admiralty Manual of Navigation. However, it is acknowledged that there are other definitions which state that relative bearings are measured from ‘right ahead’ in a clockwise direction from 0o to 360o. It is little wonder that there is so much confusion surrounding this topic. Azimuth is a specific type of bearing which measures the direction of an object in relation to true north, in the horizontal plane, clockwise from 0o to 360o. For example, in terms of azimuth, due east is 090o and due west is 270o. Azimuth is measured by use of either a magnetic compass or a gyro compass. A gyro compass is a form of electrically driven gyroscope which measures azimuth in relation to true north. Such an azimuth measurement is known as true azimuth. A magnetic compass employs a magnetised needle which is used to measure the azimuth of an object in relation to magnetic north. Magnetic compass readings must be corrected for variation and deviation in order to convert them to true azimuth. Azimuth Angle (see diagram above). Another area of confusion is the difference between azimuth and azimuth angle. In astro navigation, when we calculate the azimuth of a celestial body, the result is expressed as an azimuth angle. Azimuth angle is measured from 0o to 180o either westwards or eastwards from either north or south. 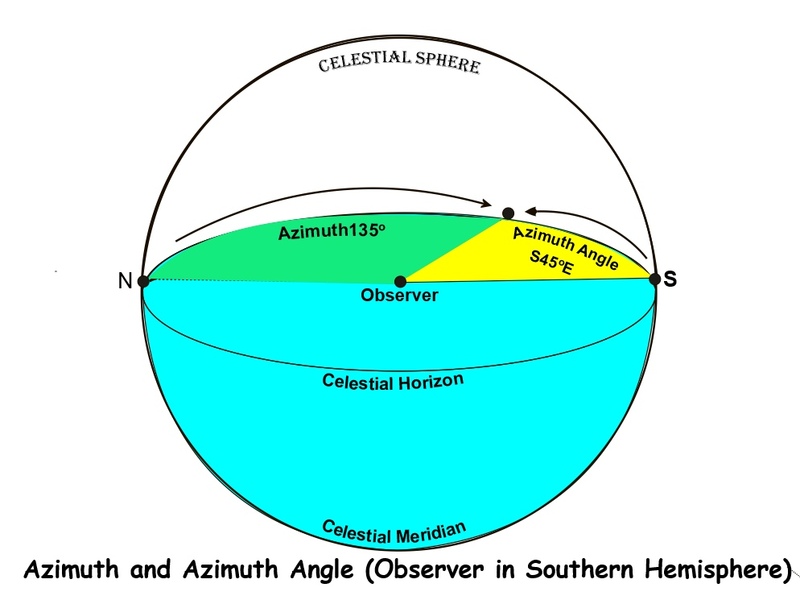 If the observer is in the northern hemisphere, the azimuth angle is measured from north and if in the southern hemisphere, it is measured from south. For example, if the true azimuth of an object is 225o, the azimuth angle for an observer in the northern hemisphere will be N135oW but for an observer in the southern hemisphere, it will be S045oW. If latitude is 55oN, LHA is 145o and azimuth angle is 120o then true azimuth is 360 o – Z i.e. 360o – 120o = 240o. If latitude is 25oS, LHA is 245o, and azimuth angle is 075o then true azimuth is 180o – Z i.e. 180o – 075o = 105o.